I try to utilize a faster process, and attempt to tackle an intricately complex fabric and handle silver and crystal all in one painting! Using a predominantly red scheme, the under painting will play an important role. Reds are very transparent, so anything underneath them will be very visible. Even if you use 3 or 4 layers of paint. 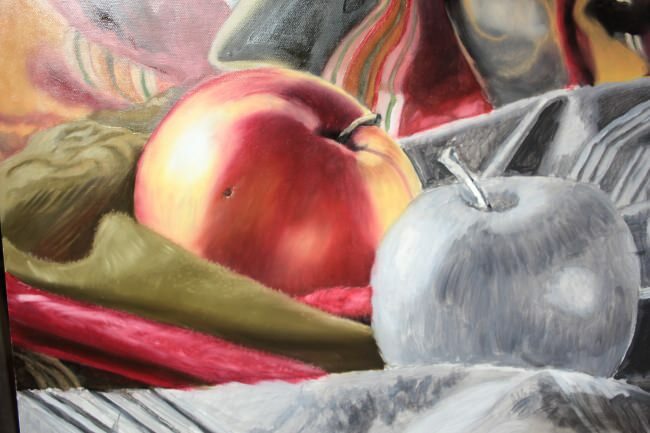 Red paint also takes ages to dry, so a dryer was also used in my mixtures for this still life with apples. I also used a very thick stand oil to help my paint self level leaving virtually no brush strokes. As you read through the demonstration, I have tid bits of valuable information through out the entire article. 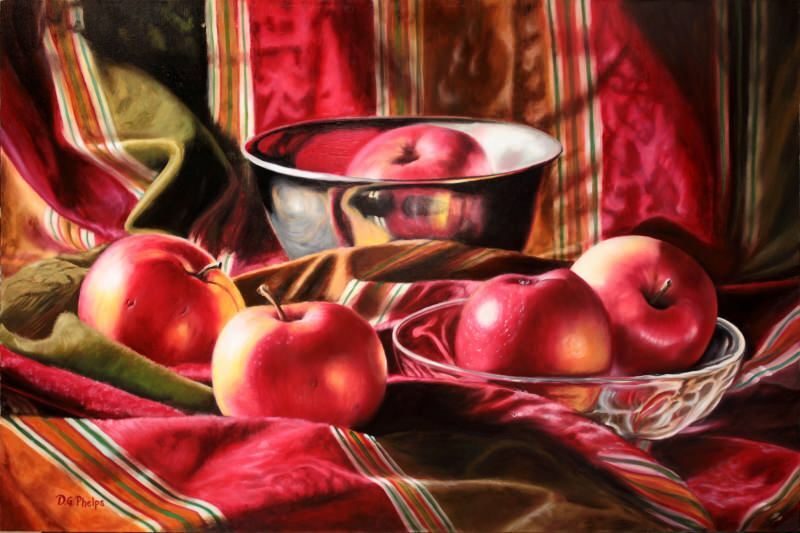 So skim through it if you wish, but taking a second longer look will help you better understand how I created this still life with apples and all it's intricate refined elements. 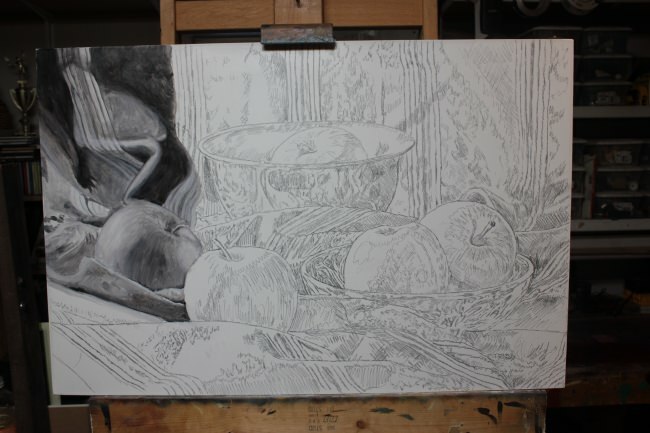 Below you see the amount of detail in the drawing, and the following picture shows the entire canvas with it's drawing completed. In the picture, I have began the under painting using acrylics. Below is a closeup of this stage. 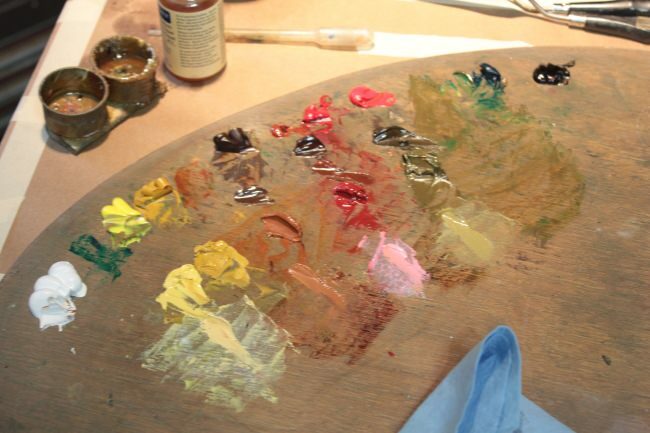 One reason acrylics are so popular is their fast drying time. Way to fast for me, because I can't seem to blend them very well. 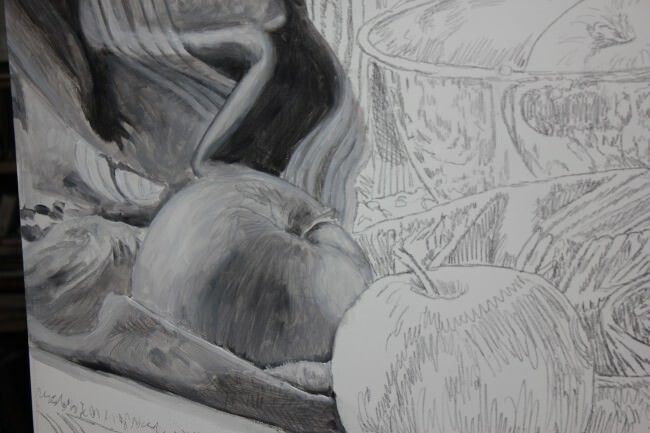 In my acrylic gray scale mixtures, I use a medium to slow the drying time down, but I don't think it helped me. I ended up just mixing several stages of the grays (about 9 piles of paint) and taking a smaller brush to apply most of the paint. In the close up below you can see some of these small brush applications of paint. Below you see most of the canvas under-painting completed. There was a little more application done to the right side to soften the pattern in the fabric, and I was then ready to start my color layers! Color mixing for our still life with apples painting. The fun part for me begins. Oil paint and all my colors laid out. I try to create at least 3 value ranges of each color I'll be using. I do a lot of blending on the canvas too, so I end up with quite a value range. 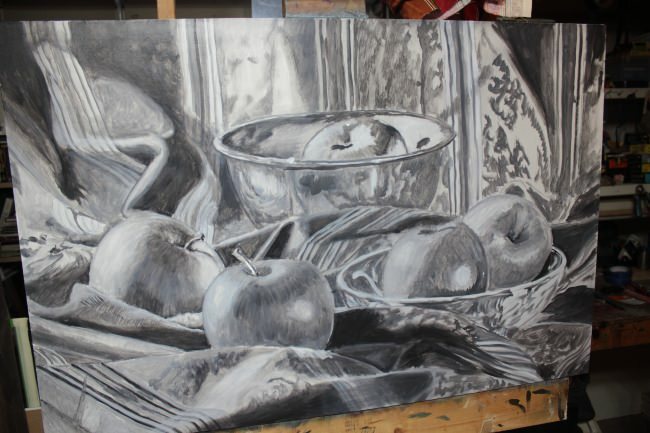 The photo below of our still life with apples is coming along nicely. There are some areas on the far right that I wished I had a better transition or blending of the acrylic under painting. I'm hoping a few layers of the reds will take care of this for me. The pattern just seemed too stark as compared to the pattern shown midway across the top of the work. Several layers of reds will calm and de-focus the pattern. The middle ground is now started. This painting has a foreground, background and middle ground. 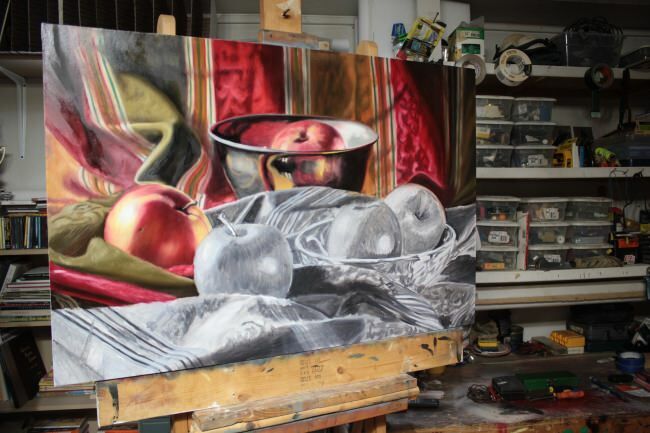 This was achieved with carefully prepared folds and lay out of the subject matter. The further you go into the painting the softer the edges became. This middle ground will have some pretty sharp focused areas as there in lies the focal points. A close up of our first apple. This was done in one sitting including the scar on the apple skin. Using the dryer (a copal medium) which became tacky pretty quick after laying in the initial color, allowed for me to come back in and put the details and texture! Super Fast! 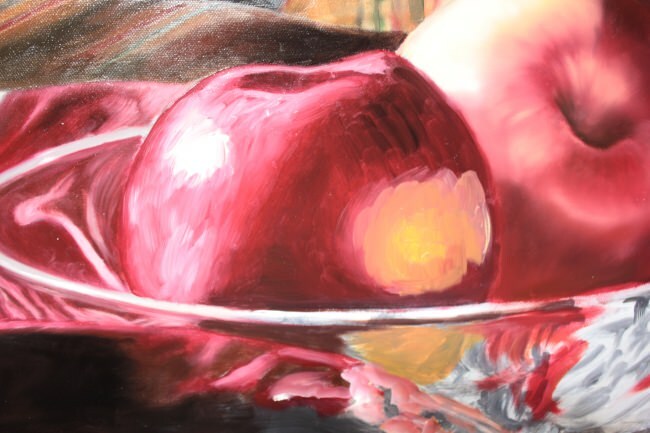 The apples shines with it's reflections of direct light from the left and reflected light on the right. Blocking in of color to our next apple. And we continue to move across the canvas from left to right blocking in the color, blending, and if possible, coming back with a few details and texture strokes of paint. Blending is achieved using a filbert and a mop brush in most cases. The paint stiffened pretty quick with the copal medium, so each element was blended fairly quickly after applying the paint to canvas. The stand oil played a part in this too! The paint could be seen self leveling right after application. It was cool to watch, brush strokes just disappeared by magic. The completed color under painting. This isn't the completed painting yet. There are final details and texture to build up, but we are very close to signing this puppy and sending it out the door! Below you will find the finished painting with details and texture. 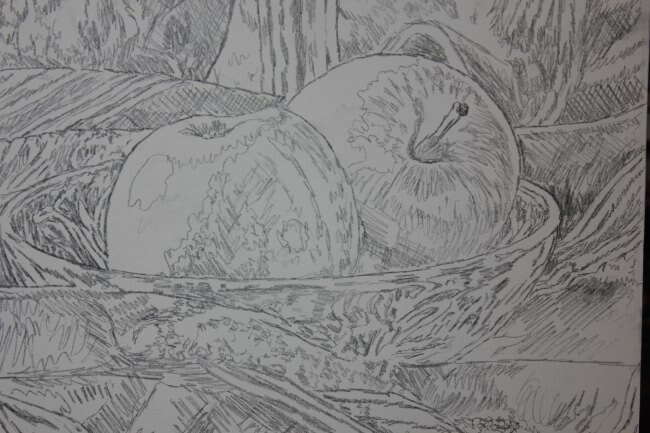 One of the things I wanted to achieve in this composition is keeping key elements within the 3rds, (the link takes you to a more detailed discussion of composing your work into 3rds). The patterned cloth uses a backward S as it snakes through the composition. Key folds within the cloth are not happenstance! They are placed on purpose to point inwards or towards a key element. I think I spent more time manipulating folds than painting the picture. 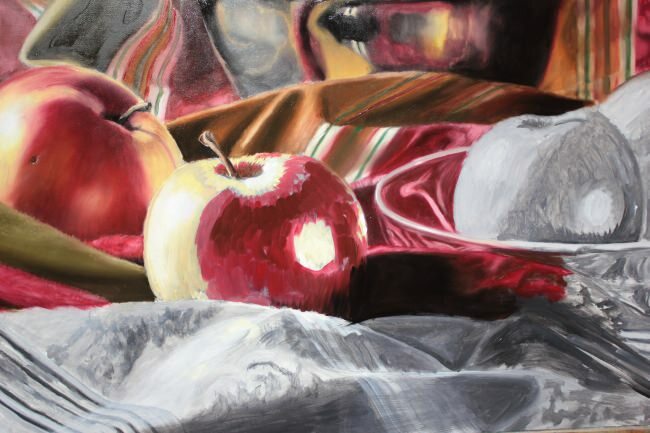 The cloth was lightly pressed with starch (before setting up the still life) in order to hold it's shape while I tugged and pushed these folds into the shapes I wanted. It was a very rewarding and fun process. 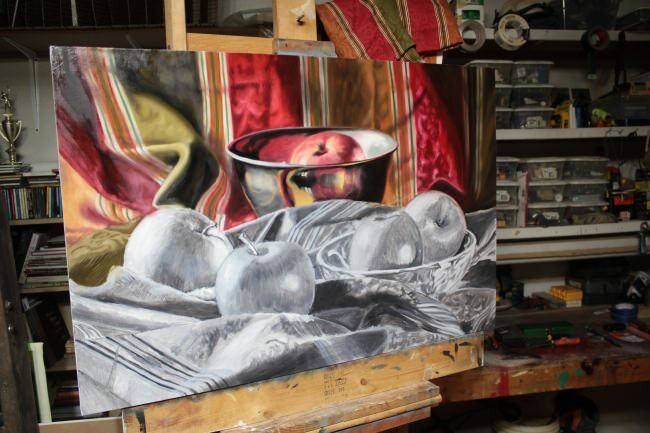 The painting was titled: "Macintosh in Silver" and is a 24" x 36" on gallery wrapped canvas. 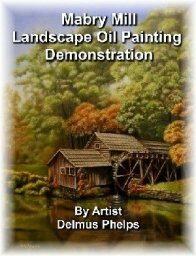 Get More information about this painting Click Here! 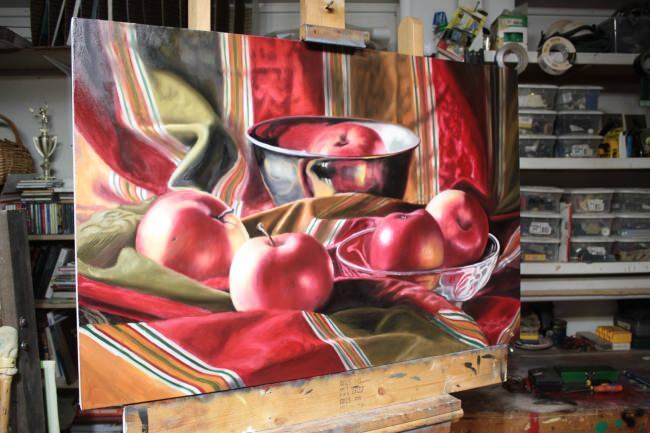 I hope you enjoyed this demonstration of a still life with apples painting.